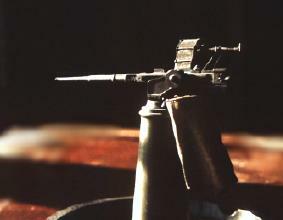 Of Swiss Design, the weapon couldn't be obtained from its original source during wartime. Charles Goodeve led the effort to get its manufacture underway in Britain. For the full story, see the memoir. This was presented to Goodeve as a memento of his efforts. It is in the form of an ashtray — although Goodeve never smoked! It is complete with the bag for spent-shell-casings that is missing from the photo above. Note the heavy pedestal (different from the tripod mount in the top photo). This is correct for the earlier (Mark II) models. 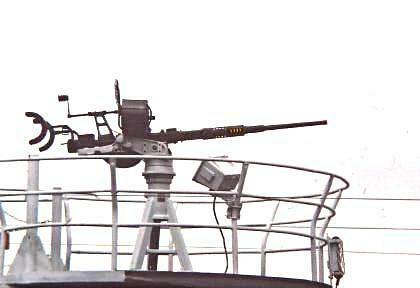 In the actual gun, the pedestal contained a hydraulic lift mechanism.